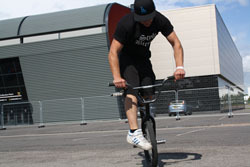 Personally speaking, the UK BMX Battle this weekend in Milton Keynes was the best weekend of Flatland fun I’ve had yet! We only had a small crew of riders, but quality always makes for quantity, and besides, having a smaller crew drew us all closer. New friendships were forged, old ones strengthened, and the riding (as ever) was amazing. BIG props to Keelan for getting the whole thing rolling!